A farmer in Siberia dumped a cart of manure in front of a bank, saying that was his way of paying out his debt. The man also described what he did as a “soft, if somewhat smelly” protest against bank policies. 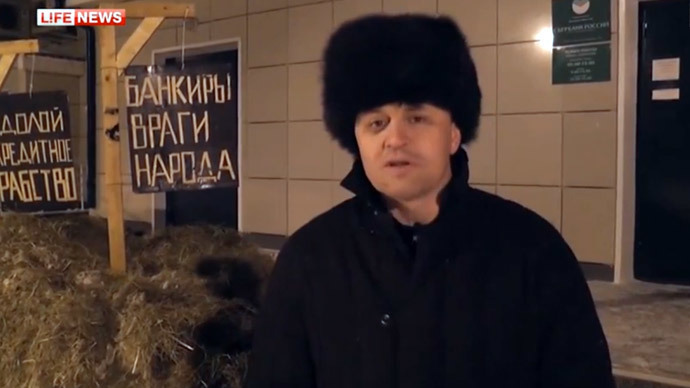 The farmer, Aleksandr Bakshaev from the Novosibirsk Region, placed banners reading, “Banks are people’s enemies” and “Down with debt slavery” atop the heap of manure he piled by the entrance of the local office of Sberbank, Russia’s biggest lender, on Friday. The farmer complained to journalists that he had nothing to pay his 40,000 rubles debt to the bank with and had been beaten up by debt collectors. Simultaneously he was fined 40,000 rubles for having the heap of manure in his yard. In despair, the man brought the manure to the bank. It took Sberbank several hours to clear the place. They reported the incident to the police. “Sberbank assesses what happened not as an act of hooliganism, but as an insult to the employees and the clients,” the bank said in a statement. “I don’t have an issue with Sberbank, I have an issue with the banks in general,” Bakshaev said. Bakshaev’s manure protest appears to be following a trend. In November, farmers in the French city of Chartres dumped some 100 tons of manure and rotten vegetables near government buildings, protesting overregulation, the sluggish economy and a lack of protectionism.